Golden Coast / News & Offers / Sales & Marketing / Blog / How videos can promote your business. Sound and vision are a tough combination to beat. Back in the heyday of traditional advertising, the big brands knew that television was the most powerful medium available. In a commercial, you have the chance to tell a story, walk your customer around your product, tell them what is so great about it at the same time as you are showing them. Moving pictures and a soundtrack can deliver a strong, logical argument or they can play to a customer’s emotions. That power to persuade is as important today as it always has been. In digital marketing, ‘content’ may well be king; video is certainly the king of content. YouTube accounts for 20% of all visits to social media sites in the UK. (Yes, YouTube counts as a social media site.) An even more impressive statistic is that YouTube is the second most popular search engine after Google. Video can help you persuade customers to buy what your wet leisure business has to offer; it can also make it more likely that they will find you on the web. If you share video on social media, that’s great too. Facebook is now the second most popular place on the Internet to view video after YouTube. Making a video no longer has to be a difficult or expensive process. You can record video with anything from your iPhone or smart phone, a simple digital camera or DSLR or you can invest in a digital video camera. The more expensive your equipment is, the better the image quality might be and the more functions on the camera you might have, but some of the most popular and most shared videos on the web have been made with the cheapest equipment. That being said, if you want to make a video that shows off a great installation your business has done or shows how beautifully designed and made a particular spa or sauna is, then a better quality camera may well be able to give you a better and more effective result. Once you have shot your video, you’ll need to edit the footage and then upload it to the web. A digital video camera will probably come with the software that you need to edit and upload your film. Your computer may already have iMovie or Windows Moviemaker already installed; if not, there is a range of free editing software available that will do the job. When you upload your video, make sure you use relevant keywords when you title and tag the video and if you upload it to not only your own website but YouTube and Vimeo as well, that will mean that more people are likely to find it. So what is this video about? First of all, like all content that you share on the Internet, it should have value from your customer’s point of view. It might demonstrate a new product that you have to offer. Its one thing describing how an automatic pool cleaner or automatic pool cover works; it’s another thing to actually show it doing its stuff. It could be a video that shows off your latest sauna installation. A few pictures are good, but when you are able to move the camera around, you can really take people on a tour of how beautiful it looks. It might be an instructional video. Perhaps it shows people how to change the filter cartridge in a spa. Once again, a lot easier to show then to describe in written words. You could bring your testimonials to life. Imagine how powerful it would be having one of your customers talking to camera about how pleased they were with your work. Or you might want to film yourself introducing your company to new customers and explaining some of the things that you can do. Whatever you choose, the trick is to keep it simple. Work the idea out on paper. Decide what you are going to say in the voice over and have a good idea of what shots you are going to need to be able to edit the video together. If the video doesn’t come out quite as well as you hoped, then you don’t have to share it and you’ll certainly have learned things that will make your next go more successful. Or you might decide to call in professional help. 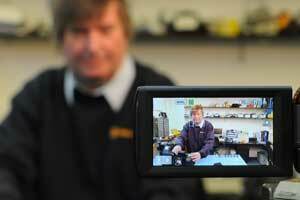 There will certainly be a video production company in your area and their charges can start from as low as £250. Whatever route you decide to take, digital technology has brought video advertising and marketing within the reach of any business in the wet leisure industry and you really should explore the possibilities and see what it can do for you.